The dreaded User Account Control lives up to its name with more control. Yes, this slider is how you will be able to reduce the number of pesky pop-up warnings, eliminating all the ones that come from Windows, for instance. There are four tiers of security in total, so basically two settings between Vista's tell-me-everything and don't-tell-me-squat modes. The sidebar is dead—the gadgets roam free! Why should keeping one or two gadget/widgets alive mean sacrificing a fifth of your clickable screen? Now when you add gadgets, they stack up on the right, but you are at liberty to put them wherever you want, and they're always there, hiding under your windows. This is an idea I wish Apple would incorporate too. Speaking of Apple and things hiding under windows, there's an upcoming "peek" feature that I will show below in the up-coming section. There are some other new interface elements that might be quite useful. Microsoft is sort of the opposite of Apple when it comes to organizing your media files: Apple helps you put them all in one place, while Microsoft says it's okay to leave them scattered around. Up until now, though, it was hard for Microsoft's software to keep track of everything. But there are two new tools, one local and one networked, that will help you track all kinds of media files. Libraries let you clump together same-type content no matter where it is on the system. If you have pictures in one set of folders, and other pictures in another, and you damn well aren't going to merge the folder, you can still track them together by adding them both to the Photo Library. Libraries even show the contents of local external storage drives you add to them, though when you unmount the external drive, Library offers to ditch its folder. VIDEO I shot the following videos to get you some immediate sense of what it's like to use the Windows 7 laptop, but though in some instances it is compared to a reasonably similar system that is also fairly clean, this isn't any kind of test. It is interesting to note, though, that while the Win 7 boots way faster here (even with the other computer's BIOS startup out of the way), it actually takes longer than the other system to shut down. But yes, these are totally unscientific, just a nice thing to observe: Totally Unscientific Video of Boot-Up Time Totally Unscientific Video of Shut-Down Time Super Scientific Video of New Window Resizing Feature WHAT MICROSOFT IS PROMISING The sad thing about the build that Microsoft handed out is that it's missing a lot of the neat stuff that they showed off at the conference, and have been hinting at elsewhere. Though we did see a lot of this stuff running on systems, we couldn't take photos or video—not even of the slides. User Interface Improvements In the last video above, I say more UI to come, and I mean "in the beta." Here are the new promised UI effects—all of which make Vista's Flip3D look like the OS equivalent of the infamous "Mission Accomplished" banner. 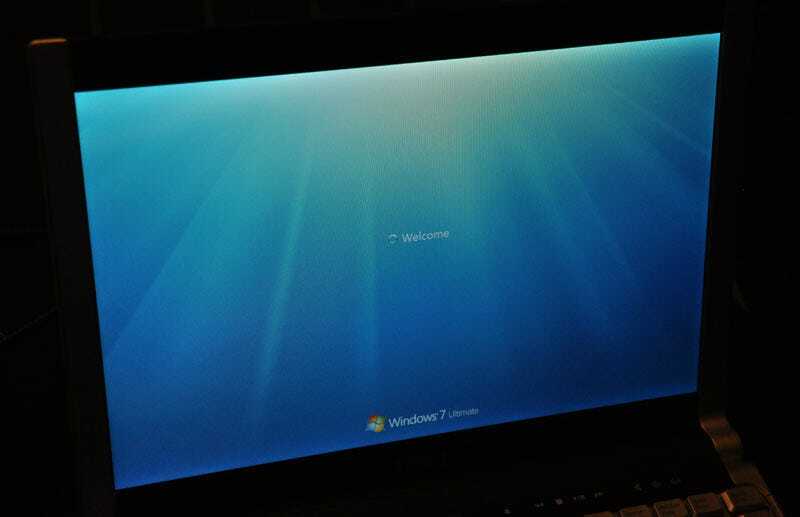 Windows 7 will have great native touch and multitouch benefits too—none shown here unfortunately: Menus subtly enlarge when tapped with a finger instead of a mouse cursor; the mouse cursor disappears when the finger touches the screen; and iPhone/Surface-style pinching and stretching are now part of the OS. Cool Device Tricks As a gadget lover like most of you, one of my favorite parts of the conference was the device discussion. I am happy to report that, for starters, Windows 7 is itself a more aggressive media playback system, natively handling both AAC and H.264 as well as DivX and Xvid without third-party download. It's also a DLNA 1.5 system with some neat tricks up its sleeve. Windows Media Player has a "play to" feature (at left) that you can reach via the Taskbar—one click and you can pull up a song, start playing, and even jump to the next. But here's the coolness: You can use that same feature to pull songs from other places on the network. And you can send the song to play through a Sonos or other compatible player on the network, rather than through your dinky laptop speakers. You can even, theoretically, if everything's visible on the net, pull DRM-free AAC files from a Mac, and tell it to play on the Sonos, re-encoding it on the fly if the Sonos doesn't support AAC. In this case, the compatibility is only as good as the interface, and the interface is only as good as the compatibility, so I am eager to see how this is executed. A nice servicey program for interfacing with gadgets and peripherals is called Device Stage. Yesterday in comments, it got maligned a bit as the new PlaysForSure, but that's a branding it doesn't deserve. Not yet, at least. The system allows camera, phone, MP3 player and printer makers to create mini interfaces for their devices. The products appear in the Taskbar when connected, with their own pop-up menus of activities, like offloading pics or uploading music. In addition to the pop-up Taskbar menu, each device will have its own pop-up page with links to ordering supplies or downloading the manual in PDF format, plus a photorealistic icon that will appear wherever the device is referred to.